A genus in the Apiaceae family, Eryngium has over 230 different species to its name. It grows in many different parts of the world. Eryngium plants are sometimes known as Sea-holly or Eryngo. At first glance, many species closely resemble thistles, although there are subtle differences. Most species are known for having spiny, hairless leaves and a dome-shaped umbel of flowers. Some varieties can grow to over 50cm tall. Some grow pastel purple flowers and either have green or purple leaves. Originally from Latin America, Eryngium plants are often found in Europe and Asia. Some species grow in coastal areas, but the majority can be seen in grassland. Some species can survive temperatures as low as -5C, which means they make great winter plants. However, they tend to be at their best during mild winters in areas such as southern England. They are a gift to gardeners who want to keep their front or back lawn looking good during the bleak months of December, January and February. Eryngium comes from the Apiaciae or cow parsley family, which explains its often prickly appearance. Among the most notable species include the Eryngium Bourgatii, which often boasts purple leaves like thistles, Eryngium Alternatum, which has long, prickly green leaves and the bulbous Eryngium Yuccifolium. Eryngium plants grow to their full potential in rich alluvial soil that prevents the roots from being waterlogged. Plentiful sunlight is also essential when growing them. Growing them in gravel gardens is ideal, as waterlogging is less of an issue with them. 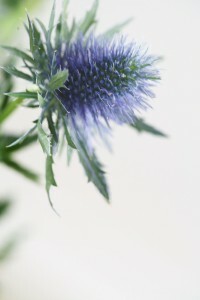 In the distant past, Eryngium plants were used for medicinal and culinary purposes. In many Latin American and South Asian recipes, some plants are used as herbs, while some species are said to have healing qualities.